John Paino at work in the kitchen. CONCORD — John Paino spent the first part of his career making tofu. Now he’s peddling salsa. The transition isn’t as far-fetched as it sounds. The entrepreneur’s objective has always been to create foods that deliver both good taste and good nutrition. 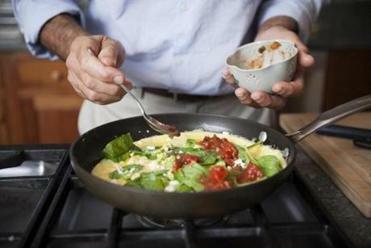 Paino prepares an omelet using his Number 9 salsa. In fact, salsa is a fast-growing food item in the United States and less processed than most packaged foods. Paino’s company is Paino Organics, and the Number 9 salsa is a zesty mixture of tomatoes, red bell peppers, chili peppers, onion, cilantro, lime juice, and garlic. “It’s a great way to get your vegetables with no fat or sugar,” says its creator. Alas, it’s the ubiquitous, dip-partnering chips that drag down salsa’s health quotient, but Paino was determined to stay true to his vision. His company produces three varieties of gluten-free tortilla strips (rectangles are better for scooping than triangular chips, he says), including Ancient Grain and Nine Veggie, made with butternut squash puree, sweet potatoes, carrots, beets, onions, and corn. “Thirty percent of the chip is vegetables, the rest is corn,” he says. Ancient Grain strips contain a blend of amaranth, quinoa, millet, and teff. 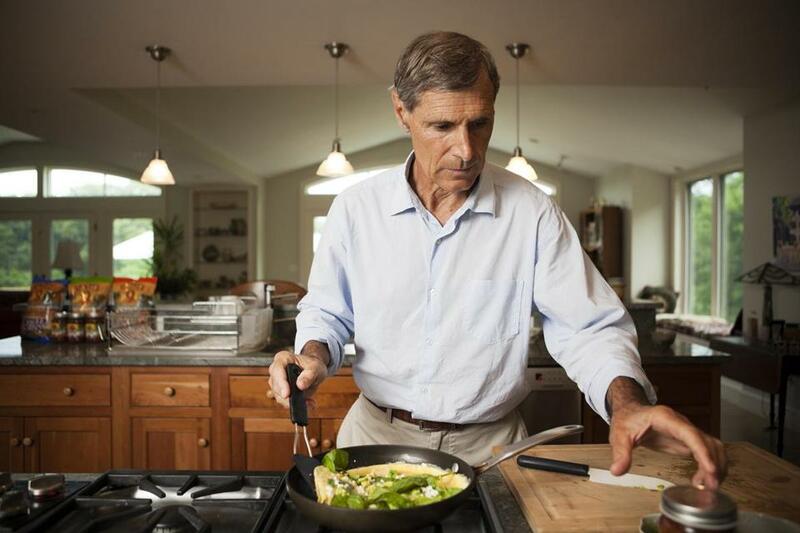 Paino, 62, got his start in the natural foods business in the late 1970s when he and his college roommate, Robert Bergwall, began making tofu and packaging it for consumers under the brand Nasoya. In 1990, when production was about 800,000 pounds of tofu a month, they sold the business to Vitasoy. Paino won’t divulge the purchase price, but says the proceeds allowed him to pursue other food ventures, including developing a soy milk ricotta used by natural foods companies as a dairy-free alternative in manicotti, stuffed shells, and lasagna. When the tofu venture first started, says Paino, “You could only buy tofu in Asian food stores.” He remembers thinking that the soy milk product would one day be accepted the way yogurt was. It took about eight years for Nasoya to turn profitable, and that was after years of consumer education, he says, including in-store demos and recipe giveaways. It took one year to come up with a salsa recipe. To a base of diced and crushed tomatoes is added a mix of poblano, jalapeno, serrano, guajillo, and chipotle peppers. Lime juice brings a spark of acidity. Compared to many bottled salsas, which can be watery, Number 9 is thick and chunky. It comes in mild, medium, hot, and black bean and corn. Selling salsa is a lot less complicated than tofu, says Paino, adding, “I wanted a product that I didn’t have to teach people what to do with it,” he says. 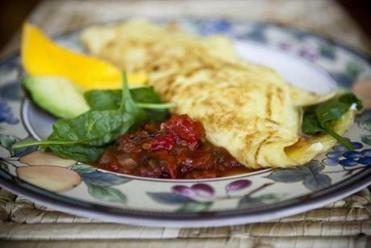 At home, Paino folds salsa into omelets and recommends it as a topping for fish, chicken, and baked potatoes. It can be used like fresh tomatoes: spooned into soups and chili, tossed into bean or pasta salads, or swirled into pan juices to make a quick sauce for steaks and chops. Paino has been a health nut for more than 40 years, eating a macrobiotic diet for almost two decades. He follows no strict guidelines now, but tries to eat healthful meals. Summers, he and his wife, Sarah, a retired acupuncturist, grow all kinds of greens, onions, tomatoes, and squashes. Salsa may not be in the same health food category as tofu, but for Paino, it’s much easier to explain. Number 9 salsas and chips are available at Donelan’s Supermarkets and Crosby’s Marketplace locations; Pemberton Farms, 2225 Massachusetts Ave., Cambridge, 617-491-2244; Verrill Farm, 11 Wheeler Road, Concord, 978-369-4494, or go to www.painoorganics.com.